Now available in gallon and half-gallon sizes! Compost Tea is a liquid biological amendment that puts a vast array of live beneficial microscopic organisms directly into your soil. This imported soil life jump-starts your soil’s ecosystem, releasing natural ingredients like nitrogen to green up your turf grass and crowd out weeds. If you are only putting dry organic materials on top of the soil, you won’t get the same result because you need the life in the soil to make the magic happen. 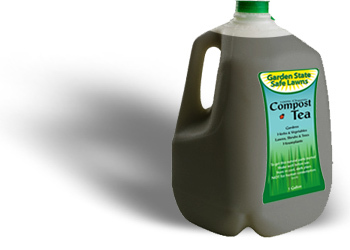 Compost Tea is tested for safety and consistency. With Compost Tea as the centerpiece, Garden State SafeLawns creates a synergistic system with other products that are customized for your lawn and landscapes. Look for it at your garden center!